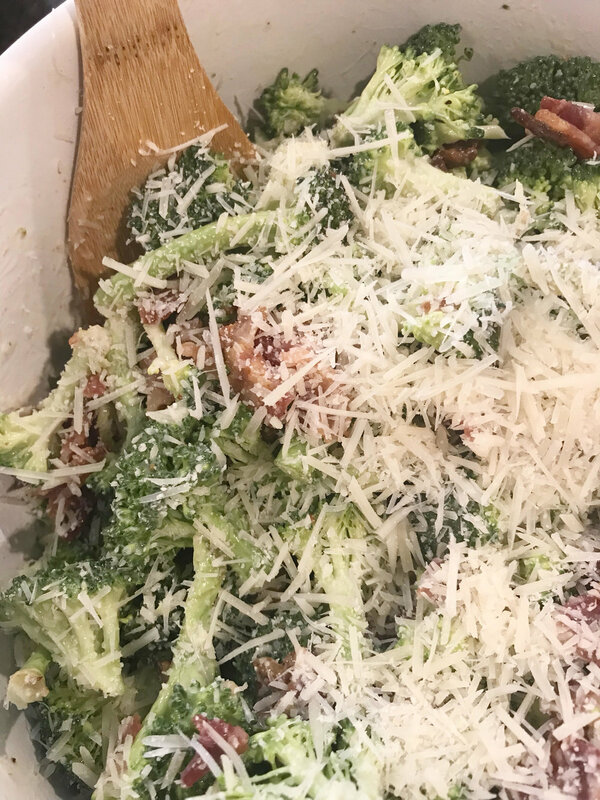 The first time I ever had broccoli salad was at a bridal shower years ago. The bride's grandma made it and I think I had about 3 helpings because it was DELICIOUS. Not only did she make the salad but she wrote down her recipe in a recipe book that was being given to the bride - I HAD to have the recipe so I snapped a picture of it and recreated it for my next party (shoutout to Lauren's grandma!). Unfortunately, that recipe got lost as they sometimes do so I've spent some time trying to recreate the taste and this has been my go-to dish for every office party, cookout and dinner party to which my friends and former coworkers can provide testimony. You're going to love this easy dish. As always, scroll further for the recipe and then step by step instruction. Chop or cut broccoli into bite sized pieces and place in a large bowl. In a separate bowl, combine mayonnaise, sugar and vinegar and stir until combined. 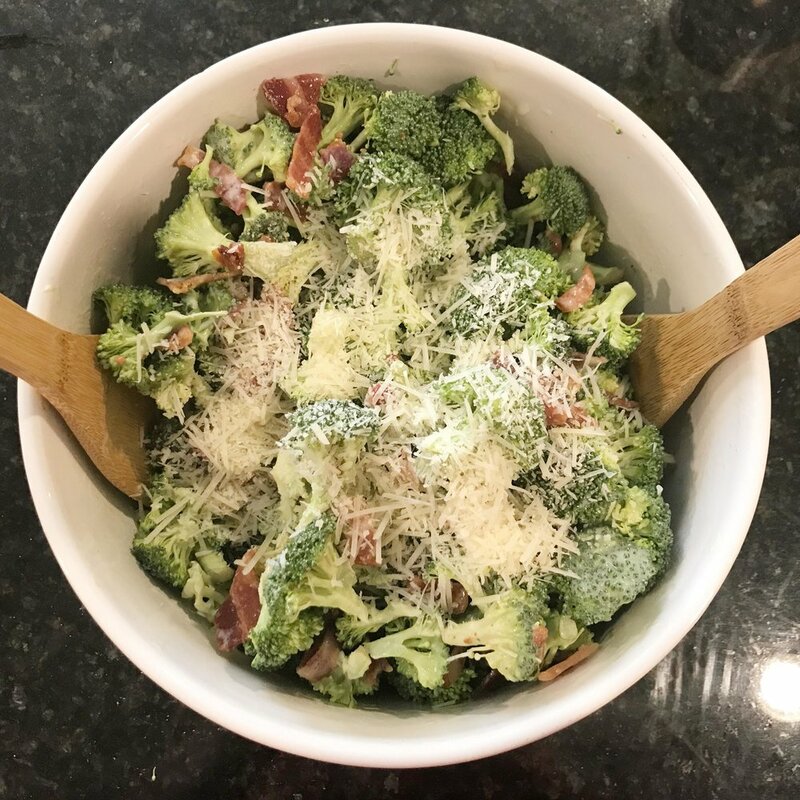 Pour mixture over broccoli, add bacon and toss. Sprinkle Parmesan cheese on top. For best results, make several hours to 1 day ahead of time and store in the refrigerator. 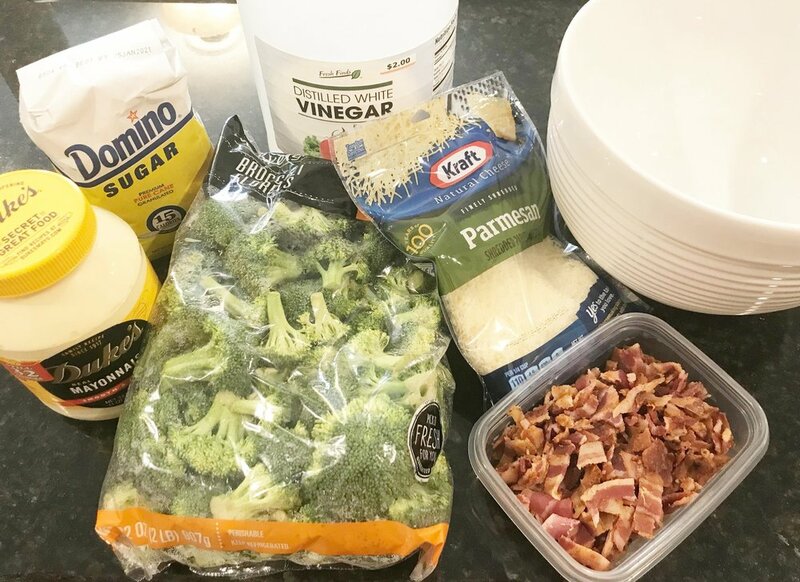 Prep the broccoli by cutting or chopping it into bite size pieces and place in a large bowl. Our grocery store had pre-cut bags but purchasing heads of broccoli works just as well. In a separate bowl, combine mayonnaise (I always use Duke's), sugar and vinegar. Stir until completely blended. Pour the mayonnaise mixture over the broccoli. Add the chopped bacon. Toss to combine. Sprinkle parmesan on top. If you're a cheese person, toss the cheese into the salad and then add a bit more on top as garnish. There are dozens of ways in which this recipe can be doctored up: red onions, cheddar cheese, cranberries, sunflower seeds, etc. Give it a try and experiment with some add ins - let me know what you think in the comment section below!